A review of Matt Black's album "Oak Street Market" which is being released Monday, May 6th on Grand Rapids label Young Heavy Souls. The album opens with a distant vocal "Can somebody say hell yeah?" Hell yeah was what I was thinking when I listened to Matt Black's latest album "Oak Street Market." The latest release from Grand Rapids grassroots Hip-Hop/Electro label, Young Heavy Souls, blends dreamy syntheses with soul beats and glitches with tracks ranging from throwback styles to new-school hip-hop and even straight up electro. "Oak Street Market" drops this Monday, the 6th on Young Heavy Souls. A CD release party will be held at Louie's Bar (608 Bridge St. NW) May 7 featuring sets from Matt Black, MC Friendly, TY Beat, Mad Snipes and Nortroniks. My favorite thing about the songs is the believability of the lyrics. Black never brags annoyingly about materialistic things, although his tracks exude a confidence that is well earned, through lyrical and compositional skill and the will to make it in a life that rarely provides head starts. Many of the songs feature guests, such as the track "Cans" featuring label mate MC Friendly and pays homage to Michigan's deposit laws for keeping food on the plate. Victoria Emanuela provides sultry vocals on a couple tracks including "Stealing Lighters," a down tempo track reminiscent of having everything you need but a lighter to get a session going. "I wanted to work with all the immensely talented musicians that I’ve met on my journeys," Black says of his guests. "I picked the features on each track to help capture the emotion and style of the music. They all helped me tell my tale of Midwest nostalgia." Black incorporates nine different vocal guests within the fifteen tracks of "Oak Street Market." During the first listen of "Oak Street Market," several times I would start feeling impressed with the vocals, then the beat would come through and blow my mind. And vice-versa. They are well intertwined leaving the typical verse-chorus-verse-chorus, often repetitive beat loops etc., format of traditional hip-hop in the dust. My favorite beat on the album comes from the song "Champloo" which fuses smoky jazz samples with late night trip-hop beats and tasteful eight bit bleeps. 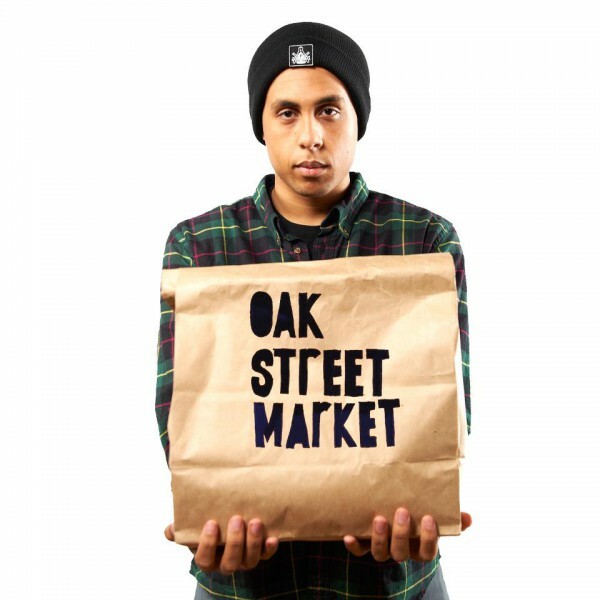 Black shared that his process for "Oak Street Market" was a little different than prior projects by not writing and producing a few songs at a time. For this effort he wrote the entire album prior to recording any of the tracks. This approach seems to lend a particular sense of unity for the project as a whole. Grand Rapids truly is on the forefront of the party friendly yet morally conscious hip-hop movement and the Young Heavy Souls crew is doing compelling work on this front. Disclosure: I admit, I was a fan before I heard the album.